Charles Ross & Son Company, the world leader in rotor/stator mixing technology, offers a new in-line system that dramatically improves powder induction in a liquid stream. Unlike other designed for fast powder induction, the new In-line SLIM does not require a pump or eductor, thereby lowering operation and maintenance costs. The unique rotor/stator generator in the In-line SLIM system includes "Progressive Spiral Porting," which produces high flow, high shear, and a high level of vacuum within the rotor/stator generator. 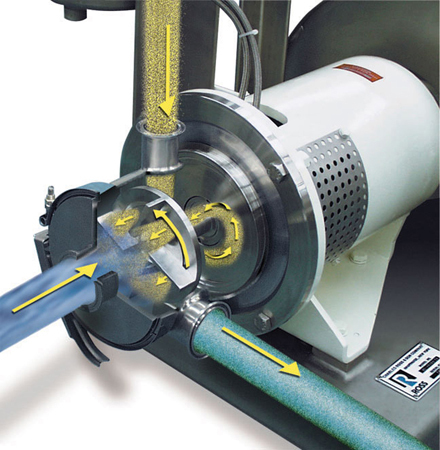 This enables the system to operate without a pump and induct powders at unprecedented rates. This results in shorter mixing cycles, an immediate lump free dispersion of the powders, improved end-product quality, and a safer working environment by eliminating "dusting" in the plant. Ross Mixing, Blending, Drying and Dispersion equipment is manufactured on five continents and is marketed worldwide. In the USA Ross operates five plants.